“...because Paul speaks of the Lord’s presence as a source of blessing for believers in his previous letter to the same audience (1 Thess 4:17-18), if we view that text as the natural context for understanding 2 Thess 1:8-9, symmetry could call for the interpretation that God’s absence is the source of punishment for unbelievers. Gordon D. Fee notes that ‘for Paul the ultimate judgment...is not in this case some expression of “hell,” but rather is ‘total, irreparable exclusion from Christ.’ That language squarely fits conditionalism’s vision, for how can anyone continue to exist forever who is totally cut off from relationship and connection with the only source of life and ground of existence?” (Edward William Fudge, “Separation,” from The Fire That Consumes: A Biblical and Historical Study of the Doctrine of Final Punishment, Third Edition. Eugene: Cascade Books, 2011). In my last post, I made the point that annihilationists like to believe their theological position lines up with Scripture; unfortunately, they hold to some philosophical claims that Scripture does not support in any trace or evidence whatsoever. I also pointed out that interpretations of soul destruction in the Old Testament (“destroying souls,” “soul dying,” etc.) are nothing more than either analogies and metaphorical statements or a reference to physical life. None of the references provided by Fudge present soul annihilation to the reader. All of them seem to indicate that man was a unity (as most scholars believe) consisting of at least a body and soul. The soul of the person stood for the entire person, holistic and complete in every part. However, there are no references to either immortality of the soul or annihilationism in the Old Testament. There are traces and glimpses of the resurrection, however, but no evidence for either side in the debate over unconditional/conditional immortality. For annihilationists to appeal to the Old Testament to justify their position (back when such a debate would never have even been present in the minds of the Hebrews) is anachronistic at best and shocking at worst. In today’s post, I am gonna cover a phrase that is commonly used by annihilationists to point to their view: that is, the phrase “away from the presence of the Lord,” or a phrase very similar to this one. In the quote above, Fudge mentions 1 Thessalonians 4:17-18, where Paul talks about the coming of the Lord. Those who are dead in Christ (the godly dead) will rise from their graves first...then the believers who are alive will be caught up to meet the Lord. Paul’s words “so we shall always be with the Lord” are intended for the believers. That is, those who believe on the name of Christ will forever commune and reign with Christ. But what about the ungodly, those who do not believe in Christ? Their punishment is to be “away from the presence of the Lord” and to “pay the penalty of eternal destruction” (2 Thess. 1:8, NASB). 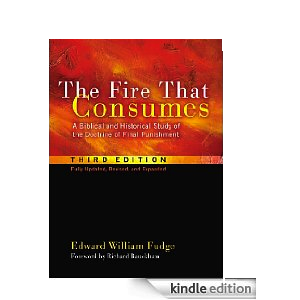 Gordon Fee claims that the expression itself does not refer to hell (see the quote by Fudge); but is this true? I think it is. Contra Fee, the context of 2 Thessalonians 1 is discussing eternal punishment. After all, does not Paul mention “eternal destruction” as the penalty of the ungodly in 2 Thess. 1:8? Is not Hell the eternal destination of the ungodly, the place of “outer darkness,” where there is weeping and gnashing of teeth (see Matthew 25:30)? In addition to this, the text of 2 Thessalonians also tells us “the Lord Jesus will be revealed from heaven with His mighty angels in flaming fire” (2 Thessalonians 1:7). What more proof do we need to see that hell is under discussion here? The question is asked regarding the existence of life apart from God, and Fudge makes it clear that conditional immortalists do not believe the ungodly can survive apart from God’s presence. Since hell is a place of darkness, a place where God cannot be (1 John 1:5-7), then no ungodly person can live eternally separated from God. “And the devil who deceived them [the nations] was thrown into the lake of fire and brimstone, where the beast and the false prophet are also; and they will be tormented day and night forever and ever” (Revelation 20:10, NASB). The devil, the beast, and the false prophet are all cast into the lake of fire and tormented forever (the same length of time that it is said humans will be tormented, see Rev. 14:10-11). But this brings an interesting question: if ungodly humanity will not suffer in eternal torment but will eventually face annihilation, does this not indicate that the fallen angels (demons) will ultimately face annihilation? If the fallen angels are annihilated, does this not indicate that Satan himself will be annihilated? And if Satan is annihilated, what then, is the purpose of Hell? Was Hell not created for the devil and his angels (Matt. 25:41)? If ungodly humanity, the fallen angels, and Satan are annihilated, what happens to Hell? It’s logical to say that Hell too, will be annihilated. In other words, if you take away Satan and the fallen angels (and ungodly humanity), there is no purpose for Hell to exist. Hell then, is annihilated because it serves no purpose. I do not see the annihilation of Hell as a concept in the biblical text...but this is the logical following of annihilationism when taken to its fullest implications. I’m no more wrong in showing where presuppositions lead than the late Francis Schaeffer was in showing individuals how their evolutionist presuppositions led to moral absurdity and the meaninglessness of life (see also William Lane Craig’s Reasonable Faith, where he talks about this idea in his chapter “The Absurdity of Life Without God”). If everyone in Hell is annihilated, why shouldn’t Hell itself be? This train of thought just seems inevitable to me. The truth is, according to Matthew 25:41 and Revelation 20:10, Satan, the demons, false prophet, beast, and even ungodly humanity will spend a consciously-tormented eternity in Hell. There will be no annihilation of the ungodly, Satan, or anyone else in the everlasting torment. The question we must ask ourselves is this: “Do the Scriptures show me annihilation? Do the Scriptures present the utter annihilation of the ungodly?” If the Scriptures do present the reader with annihilationist doctrine, why does it seem that the torment of Hell is without end in the biblical text? There are two roads. Either the traditional view of hell is right (and man will be consciously tormented for all eternity) or the annihilationist view is right (and ungodly humanity will cease to be). May the Lord grant our hearts, minds, and consciences insight into this contemplative issue. God bless.